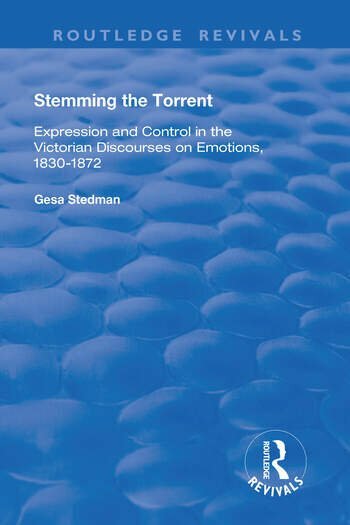 This title was first published in 2002: Gesa Stedman mines the vein of emotion in Victorian writing to unearth new insights into the ways literature responded to the dramatic social and political changes then taking place. Contemporary research from various disciplines, including sociology, ethnology and history, inform this study, which juxtaposes canonical material such as Dickens' "Hard Times", Charlotte Bronte's "Shirley" and Germaine de Stael's "Corinne" with popular novels and non-fictional texts, such as "The Education of the Heart" by Sarah Ellis and Darwin's "On the Expression of the Emotions in Man and Animals". The analysis deals with emotions applying to both genders, but includes a special section examining the representation of emotion in relation to women. The book aims to provide new insight into the literature of the period, and brings to light new material for scholars interested in the philosophy and psychology of emotions.